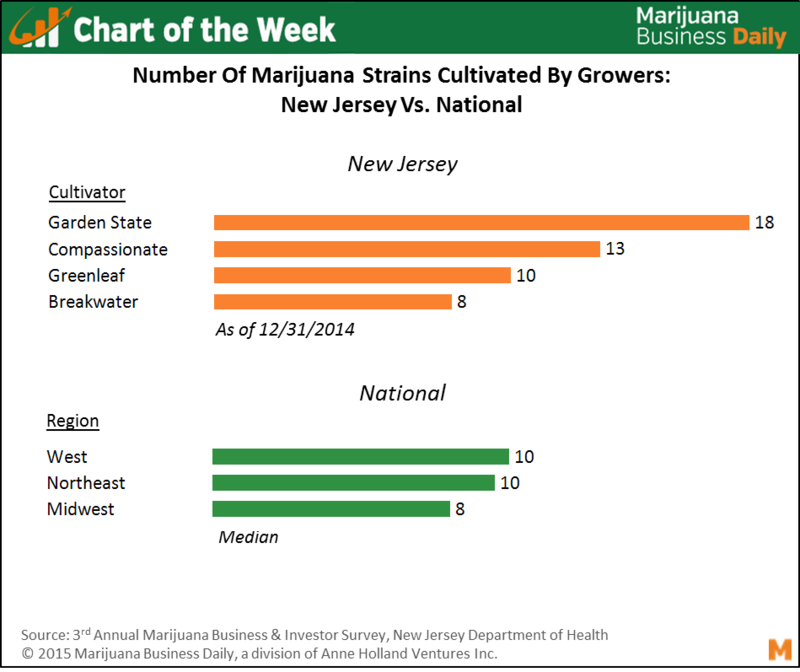 Chart of the Week: Marijuana Strain Cultivation in New Jersey vs. Typical Grow Site in U.S.
New Jersey is home to only a handful of licensed medical cannabis producers, but they cultivate more strains on average than the typical marijuana grow site in the U.S.
At the end of 2014, Garden State Dispensary was cultivating 18 different strains – roughly twice as many as the typical grow in all states that have legalized medical or recreational cannabis, according to data from the New Jersey Department of Health and a survey spearheaded by Marijuana Business Daily. Breakwater Alternative Treatment Center was cultivating just eight strains – the fewest in New Jersey and two lower than the average for that area of the country. The other three companies that were actively growing marijuana in New Jersey at the end of 2014 reported producing the same number or more strains than the typical cultivation site in the northeast. Chalk it up to a desire among New Jersey companies to compete by simply offering more than the competition. The number of strains grown by the average cultivation company varies slightly by region, ranging from a high of 10 in the west and northeast to a low of eight in the midwest. On a national level, 70% of growers cultivate fewer than 14 strains, with a full half cultivating fewer than ten, according to the 3rd annual Marijuana Business and Investor Survey. The highest number of cultivated strains reported on a national level is 35, though only 5% of growers cultivate 30 or more strains. Cultivating many strains at once is typically a short-term competitive strategy, according to Scott Hawkins, principal at the cannabis consulting firm Grun Strategic. “[They are] trying to differentiate themselves through variety…as a badge of honor to best the competition,” Hawkins said. He added that most growers cultivating a high number of strains do so simply to offer more variety, not because each strain has effective properties for specific underlying medical conditions. “They are substituting variety for efficacy,” he said. Research has shown that people can only handle so many choices at a time, so the market will eventually determine what a manageable number of strains to select from looks like. In the meantime, consumers will continue to see a huge variety of products as this golden era of innovation in the marijuana industry tests the limits of creativity. Update: The original version of this chart mistakenly included strain data for black market growers in the south. That information has been removed, as the chart is meant to reflect stain numbers for commercial growers in states with MMJ/recreational cannabis laws. This seems very flawed. Especially when listing the south and the mid-west as comparative locations. I also question the source listed.